Share Us, Like Us, & Subscribe to Us!! We feel it is important to share that we do not judge the owners of problem birds, we know that many factors contribute to a bird with serious issues. We applaud owners who realize that their bird needs help they are unable to give and decide to surrender the bird to someone who can help. We, and the birds, are grateful for this selflessness. This page is dedicated to our effort to educate and inform potential adopters and those who are interested in how we care for our birds and prepare them for happy and healthy lives with their new families. Allie has arrived at CBH!! This gorgeous bird's rescue was a community effort and we were so, so grateful for the assistance...and we were able bring her home not a moment too soon! We don't know much about Allie's history, except that for the last couple of months she has been living with a couple that could not meet her needs. We payed a $750 ransom and picked her up after more than a week of pleading with her owners to let us take her. 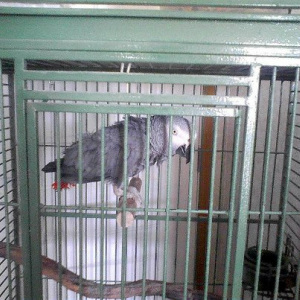 She was supposed to have her cage included, but when we arrived to get her we were informed it would not be included. She also did not have any personal items - no toys, no favorite food/water dishes, no "snugglies"....happily, we make our own toys and play equipment so within a day or so, Allie will be toy rich!! On the 30 minute drive home, in spite of a normal amount of stress, Allie was very hungry and ate a considerable amount of food. When she arrived it was clear that she was in desperate need of a bath, her nails and beak were in serious need of trimming (we don't often see beaks so long!! ), and she was absolutely loving all the attention! And we are thrilled to be able to give all of those things to her! In the next few days, Allie will be visiting our fantastic vet for a good check-up and we will let him be the "bad guy" and clip her nails and beak!! We will be adding Aloe to her diet and topically to shape up her feathers. There is no evidence of chewing or plucking, but they are extremely rough from being so filthy. We will continuously update this page and Facebook with Allie's progress. 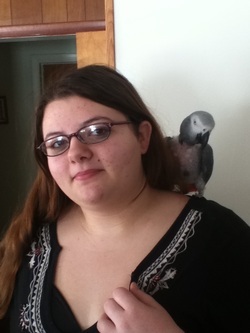 In spite of what we've heard, Allie is a lovely and very social macaw! Allie was adopted by Gonzo's parents Elizabeth and Ryan and is doing beautifully!! We hear from Allie and Gonzo on a regular basis and are happy that they will remain part of the CBH Extended Bird Family for many years to come!!! Pako came to us from a big hearted woman who took him in because of the situation he was in. She unfortunately she did not have the experience required to handle his issues. Pako is a very sweet boy who just happens to get a little over excited when held. He has a mild case of sustained sexual behavior and was plucking. Other than that... Pako is a sweet boy and very hand tame. We will work with him to help get this issues under control so he can be the complete joy he wants to be. Pako is still working through some behavioral issues. Since bringing him to CBH, we have modified his diet and some other aspects of his daily routine to discourage his sexual behavior and he has responded beautifully. Pako is still working on his plucking issues, but we are working hard to help him conquer that habit! Pako WILL be available for adoption at some point, but at this time we expect to have him for at least several more months. Pako is doing really great with his new family and flock mates. His feathers are continually an issue, but for the most part, Pako has conquered his behavioral issues and most often is in gorgeous feather!! Rasta had a normal life his first two years. unforunately the last thirteen have been far less than normal. 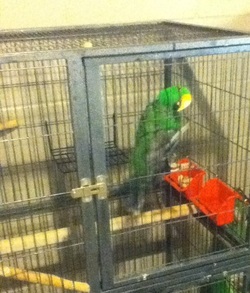 For the last thirteen years Rasta has spent very little time outside his cage. He did not get much interaction with people or other animals at all. This older picture (provided by the owner) is of what the majority of his life has been. Due to the lack of normal interaction for so long... Rasta is untrusting, fearful of being approched, and extremely scared of hands. He will need many months of trust building before we start behavior training. 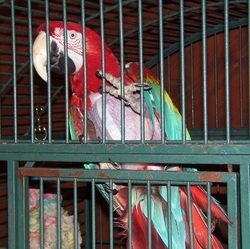 First things first... Rasta needs a good long shower and a complete cage makeover! Rasta has settled into life at CBH....he's grown into one of the senior big men on campus! We have established quite an African Grey community here, with three Congos and a Timneh, and Rasta is the local comedian. He's also the most proficient talker and can be heard laughing hysterically quite often. Rasta is still working on growing feathers back in, but has made significant improvements. We hope that we will see some big strides for Rasta and Pako as winter passes into spring and summer. Furnace heat dries everything out and we do not have spa days as often as in summer...we think that warmer weather and more time outdoors will do wonders for their skin and feathers. We also plan to try some all natural products for skin soothing....winter is tough for everybody, we're getting through it, but all of us are looking forward to spring/summer!! Rasta is eating great, all his veggies, grains, nuts, some seed, some fruit....and of course, some favorite treats. He has also started to play more often with his toys. He talks to the other birds constantly and has even started to explore on his own. Two weeks ago, Rasta took his first steps (of his own accord) out of the bird area and into our living area/office. I was working on the computer and glanced down, not surprised to see a bird coming to visit...until I saw it was Rasta!! It was quite a wonderful surprise and we are so proud of his progress!! Rasta still has work to do, especially in terms of human interaction, and he will be with us for the foreseeable future, but we are absolutely certain that Rasta will continue to improve and enjoy his life more every day!! We found Buddy the same place we got Paco... Buddy was having some health issues at his owners home. 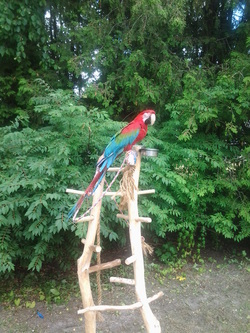 We made her a very nice custom wood play tree for her other birds in exchange for Buddy and a few cages... with the intent of sending him and his 2 cages to a special home that can take care of his special needs. 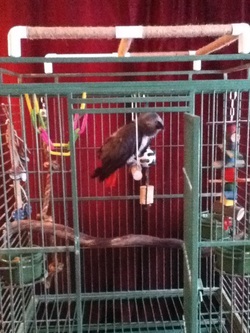 A good friend (and Amazing bird handler) named Jackie now has him and he is scheduled to see his new vet soon. We believe that with some changes in Buddy's environment, diet, routine and possibly some light medication... He will be a very happy and healthy boy! s Updates on Buddy soon. Buddy had a seizure yesterday, but it was not a bad one and he's ok! Jackie and the vet are keeping a close watch over him. They are monitoring him for about a month to gather as much accurate information as possible about his condition in order to diagnose and treat him. It will be a long road, but he is on his way to recovery! His new diet suits him well and he is working on settling into his wonderful, new home. After many years of going without care that he needed, Buddy is looking toward a bright, healthy, and happy future!! Buddy has now decided that Jackie is his new best friend! After his seizure and Jackie's comforting, Buddy decided that she wasn't so bad after all. Previous biting and mistrust turned completely around and he's now cuddling, kissing, playing with and loving his new Mom!! Buddy really is a big teddy bear and the quick transformation is proof! !